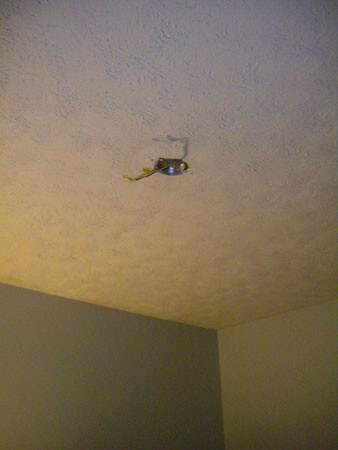 We’ve just completed day two of operation install a ceiling fan, and it’s not going well. Between the two of us (my husband and I), we’ve been to Lowes four times this weekend. Granted, one of those times was not ceiling fan related, but I’m still counting it. The fan is supposed to go in our bedroom. When we bought the house, we knew the light fixture worked, but the fan did not. We bought the fan a few weeks ago, and chose yesterday as the installation day. It took us three hours to take down the previous fan. Probably not a good indication of how the whole installation was going to be. We even called in my mom to help this afternoon (I know, happy Mother’s Day, right?) We got a little bit further, but still ran into big issues. At least we now own a drill bit that will cut through metal. That’ll come in handy some day, I’m sure. It’s just SO frustrating. We have very little to do in this room. We’ve painted, replaced the bed, bought new bedding, dressed up the room. We want to install the new fan (it matches our new bed!) and maybe add crown molding. And then it’ll be perfect. It’s already close to perfect, and I just want this to be finished. This morning at church, the pastor spoke about homes – and how the words house and home aren’t really interchangeable. Our home isn’t necessarily the objects that are in it, but more of “us” and how we interact with each other. The sermon really spoke to me and I think it’s exactly what I needed to hear today. You see, my husband and I aren’t good at doing home improvement projects together. One of us usually yells. Sometimes things are thrown (usually a stupid tool.) And often, one of us walks out to let off steam. Our house is 37 years old – older than either of us – and it’s often difficult to deal with. Today I made a conscious effort to not yell, get visibly frustrated with my husband, and in the end, I focused on how far we’ve already come in making this room more “homey.” Sure, I’m frustrated with the previous owners for not making some of the updates that we’re forced to make now, but we’re making it our home. Oh, and with the help of Google, I found an electrician who will install the fan for $75. He even called me back within two hours of sending an email. I’ll let you know if we spring for it, or get the fan up ourselves. I so feel you on this post. I bet I have made a dozen trips to Lowe’s this weekend. We are remodeling the bathroom and I still don’t have a bathtub. Your description of you and Kenny working together match Bill and I to a tee! our projects often end up with one of use being frustrated too. the important thing is to keep trying! Hope the fan is up soon!